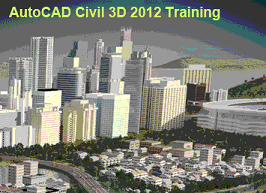 Our AutoCAD Civil 3D 2012 Training consists of more than 15 hours of video based lessons. This training dvd will show you how to use the application for civil engineering design and documentation. Used primarily by civil engineers, this program helps project teams deliver higher-quality transportation, land development, and environmental projects faster. Our training will help you learn to work more efficiently as you design ideas and analyze what-if scenarios to help optimize performance as your projects are built. Our Civil 3D 2012 Training will help you become more productive as you learn basic and advanced topics, including how to create, edit and modify Civil 3D design objects, add annotation, obtain information, import/export and use Civil 3D data in other applications, while helping you to deliver more innovative design solutions.